To describe the radiology-related Twitter network through the analysis of the most commonly used radiology-associated hashtags. A total of 959,366 tweets containing the hashtags from the 9 most commonly used radiology-associated hashtags composed by 66,568 Twitter users from October 13, 2010 to February 22, 2018 were analyzed. Twitter activity metrics, engagement, user characteristics, content analysis, and network analysis were obtained using the health care social media analytics platform, Symplur Signals. 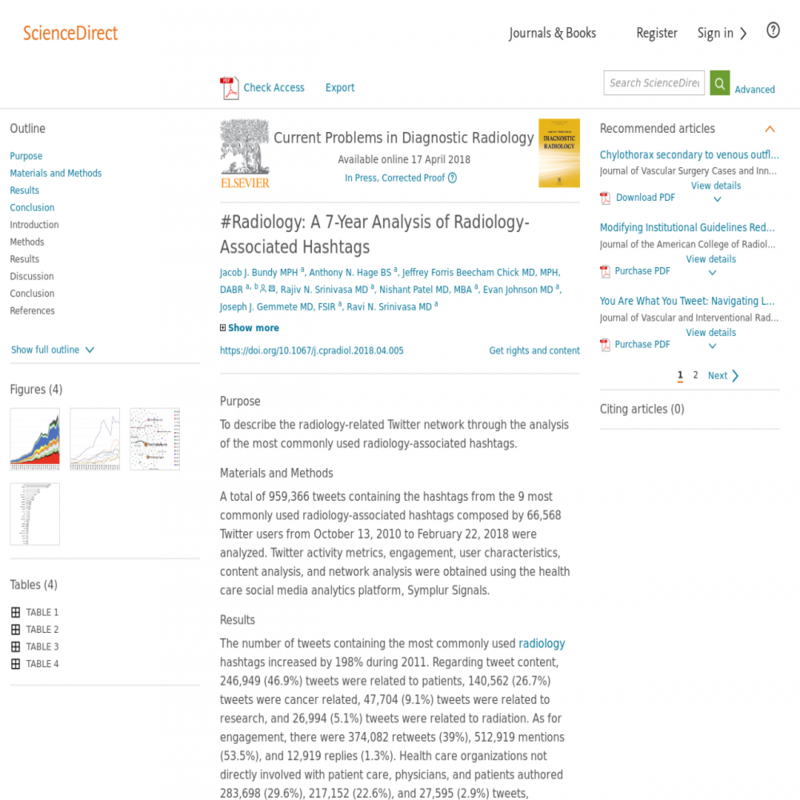 The number of tweets containing the most commonly used radiology hashtags increased by 198% during 2011. Regarding tweet content, 246,949 (46.9%) tweets were related to patients, 140,562 (26.7%) tweets were cancer related, 47,704 (9.1%) tweets were related to research, and 26,994 (5.1%) tweets were related to radiation. As for engagement, there were 374,082 retweets (39%), 512,919 mentions (53.5%), and 12,919 replies (1.3%). Health care organizations not directly involved with patient care, physicians, and patients authored 283,698 (29.6%), 217,152 (22.6%), and 27,595 (2.9%) tweets, respectively. Network analysis demonstrated health care organizations not directly involved with patient care, physicians, media organizations, and individuals working in the health care industry in nonclinical roles to be the users most active on the radiology-related hashtags on Twitter. Radiology-related hashtag use has grown substantially over the years, with a majority of the discussions involving physicians and health care organizations not directly involved with patient care.